Clara Cohen is a graduate of the International College of Traditional Chinese Medicine of Vancouver, where she completed a 5 year program at the Doctor of Traditional Chinese Medicine level. She has been a B.C. registered Acupuncturist with CTCMA since 2003, and focuses mainly in gynecology and mental health. 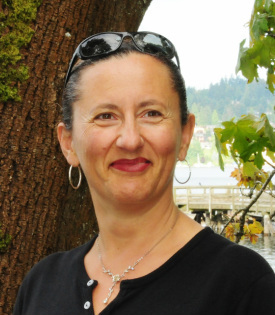 She has been part of the Port Moody & Coquitlam Acupuncture community for many years. She has successfully treated uterus cancer, ovarian cysts & fibroids, dysmenorrhea, fertility issues, anxiety, depression, insomnia, as well as assisted many patients with IVF and IUI support. Clara Cohen has been a professor and the Chair of the Chinese Medicine Department at the Boucher Institute of Naturopathic Medicine in New Westminster, since 2008 and enjoys every minute of it. She also keeps taking seminars and workshops on Chinese medicine & natural health to further improve her knowledge and to help her patients with their healing process. Over the years, she has taken extensive training under well-known specialists such as Sharon Weizenbaum, Jane Littleton, Richard Tan and Robert Chu. Clara has been a presenter and speaker at many conferences. She spoke at the 2011 & 2013 BCNA conference in Vancouver, about Chinese medicine and fertility, and acupuncture during pregnancy. She was also a speaker at the first Cancer Symposium presented by the Boucher Institute in February 2011, about the benefits of Chinese medicine as part of cancer treatments. In 2015, she was a contributor and published author in the Medicinal Roots Magazine. Clara originally comes from the French Alps, where her family used Chiropractic, Acupuncture, Homeopathy, Physiotherapy and Massage as their main healing sources. She graduated from Grenoble University with a Bachelor in Applied Nutrition. When she moved to Canada she became a Personal Trainer, and managed 2 fitness clubs in Vancouver and West Vancouver for 8 years. She has extensive training in exercise physiology, sports nutrition and weight issues. She has appeared on Breakfast Television twice, and has given countless workshops on natural health to many corporations, schools and community centres. She maintains her CPR and First Aid certification current. On her spare time, Clara enjoys hiking with her husband and her yellow Labrador retriever, mountain biking, playing tennis, and trail running. For relaxation, she loves to read with a cup of tea, cook French food while having philosophical conversations with her friends or watch a good movie. Clara is very excited to bring Healing Cedar Wellness to Port Moody and its surroundings, offering the best in natural health care for the entire family. Clara has 2 published articles in the Medicine Roots magazine. In the 2015 spring and fall issues.